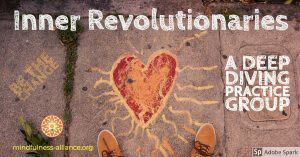 Inner Revolutionaries is a teacher led group of particularly passionate folks in our community who truly wish to embody a mindful revolution from the inside out, doing the difficult, inner work of the heart so that we can be the change we want to see in the world. This group is meant to complement and deepen a mindfulness practice (including our weekly practice meetings). Our rotating schedule of trained mindfulness teachers join participants in tending the "inner garden", preparing and maintaining fertile ground for cultivating the seeds of social justice and world peace. This is accomplished through a triad of reading/listening, practice, and reflection. Each session introduces a timely topic addressing some of the most pressing social issues of our time or one of the more paradoxical/culturally radical aspects of mindfulness practice. Guided practices, supportive resources, and facilitated “truth sharing” will be offered. Opportunities for practice between sessions will also be suggested. We request that you commit to a year of monthly meetings so we can build a community of trust, openness and authentic connection.